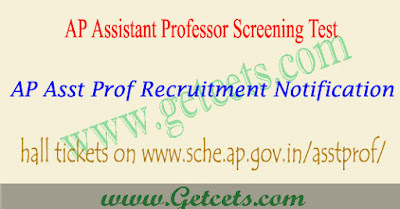 AP Assistant professor screening test hall ticket 2018 download : AP Asst prof recruitment 2018 hall tickets released on www.sche.ap.gov.in/asstprof/. Applicants who have appear for AP Assistant professor screening test 2018 can download admit card through official web portal. Officials of Andhra Pradesh universities will upload AP Assistant professor exam hall tickets 2018 on their universities websites. So candidates may visit www.sche.ap.gov.in/asstprof/ and download AP Asst Proof hall ticket 2018. AUthority is going to conduct the Screening Test for Assistant professor Posts on ** March 2018. Candidates who are aspiring to start their career in University submitted their online application forms before the last date and are waiting for the admit card. AP Assistant Proof Admit Card 2018 is uploaded on its official website www.sche.ap.gov.in/asstprof/. Call letter is the crucial document that any applicant must carry while going for the exam. To download Asst Proof Call Letter candidates have to enter their Registration number and Date of Birth in the given fields. Exam venue, time, candidates roll number, and image are clearly mentioned in the AP Assistant Proof Admit Card 2018. 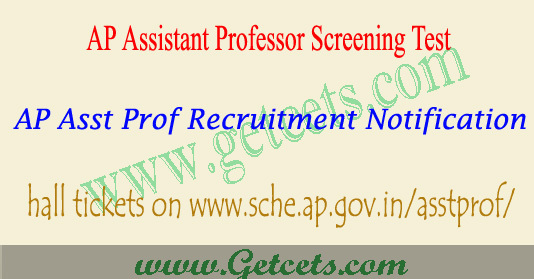 Frankly ask us by comments and share this AP Assistant professor screening test hall ticket 2018 download article with friends on social media for appreciation for us and we may again continue for the AP Assistant professor screening test hall ticket 2019 download and Manabadi AP Assistant professor screening test Results 2018 download 2018. 1st phase 845 posts details. Andhra University 237, Sri Venkateswara 126, Acharya Nagarjuna 72, Sri Krishnadevaraya 89, Sri Padmavathi 16, Dravidian 11, Yogi Vemana 39, JNTU, Ananthapuramu 95, JNTU, Kakinada 11, Adikavi Nannaya 24, Dr B.R Ambedkar 33, Krishna 20, Rayalaseema 39, Vikrama Simhapuri 33. 2nd phase Andhra University 104, Sri Venkateswara 48, Acharya Nagarjuna 08, Sri Krishnadevaraya 23, Sri Padmavathi Mahila 11, Dravidian 02, Yogi Vemana 09, JNTU, Ananthapuramu 36, JNTU, Kakinada 23. Total Posts in Second phase 264 posts. The call letter appears on the screen.